The Inside Scoop. Speaking with a Dscoop Member. Peer affinity groups offer members opportunities to learn and socialize through online forums and annual member events. They also help print shops to better understand print strategies for maximizing company profits. Part one of this two-part article series highlights peer user groups dedicated to the production print industry. 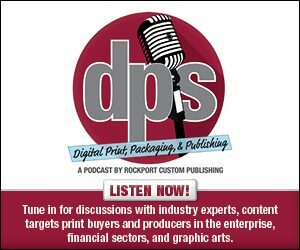 This week, we look at a print shop that actively participates in HP’s peer affinity group, Dscoop. Founded in 1887 in Leominster, MA, Boutwell, Owens & Co. is an independent manufacturer that offers commercial printing, graphic management services, printed paperboard packaging design, and manufacturing. The company is currently located in Fitchburg, MA. Boutwell, Owens & Co. started with one employee as a commercial printer for local clients. Today, the shop has over 200 employees that span across North America from its 200,000-square foot workspace. The shop produces printed paperboard packaging and advertising specialty items. It uses various paperboard suppliers and paper supplies to design and produce blister cards, blister form fill and seal blanks, folding cartons, header and insert cards, skin pack sheets, and stretch pack fold over cards. Boutwell, Owens & Co. uses an HP Indigo 30000, which features inline priming capabilities to print on any off-the-shelf substrate including metalized and synthetics. The HP Indigo 3000 prints 4,600 sheets per hour in Enhanced Print Mode. It handles media thickness from ten to 25 pt. and has a maximum print width of 29 inches. HP Indigo printers use HP ElectroInk, which complies with industry standards for low migration inks and meets FDA and EU regulations for food contact materials. It is a liquid ink that combines electronic printing with liquid ink and contains charged pigmented particles. It is rub resistance for daily use, shipment, and handling. The shop also uses the Highcon Euclid II Plus and the Highcon Beam purchased in 2015. The Highcon Euclid series offers production speed digital cutting and creasing for analog to digital workflows. It handles media up to 30×42 inches and supports label and paperboard thicknesses from 0.2 to 0.6 millimeters. The Highcon Beam digital cutting and creasing solution handles 5,000 sheets per hour. It is intended to replace the conventional die making and setup process with a digital technology for improved responsiveness, design flexibility, and the ability to handle various applications in house. For three years Boutwell, Owens & Co. has been a member of HP’s vendor group, Dscoop. Founded in 2005. Hodges says the print provider joined the group under HP’s advice. “We know the learning curve was very uphill and Dscoop provided the networking, support, education, and peer sharing that appealed to us,” he adds. Boutwell, Owens & Co. attends Dscoop meetings, watches Dscoop news, and presented at the 2017 Dscoop annual conference. Between 2,000 and 2,500 people attend the annual Dscoop Americas conference. Full price attendance is $1,295 and features new trends, educational opportunities, and peer networking. Hodges believes the primary benefits of the group are shared learning opportunities, networking, problem sharing, and collaboration. “You have to be aware of competitive situations and not violate industry and legal constraints,” he says. Dscoop offers its members 24/7 online discussion forums, access to Dscoop University, and a listing in the Dscoop Print Directory. There are currently more than 5,000 active individual members from more than 1,000 print providers. The community also includes over 100 partners and an active community of industry thought leaders. Hodges says Dscoop directly benefits the company by providing training, problem resolution, and introducing the company to new market opportunities and potential clients. “Dscoop has been an important component of our digital implementation effort and every year we look forward to attending the next Dscoop event,” explains Hodges. Boutwell, Owens & Co. has made friends, built alliances, and changed its go-to strategy from its Dscoop experiences. Print shops like Boutwell, Owens & Co. take advantage of the offerings provided by peer affinity groups. These groups connect print providers with consumers for equally valuable opportunities. Most include annual events for members and industry leaders to connect and collaborate.